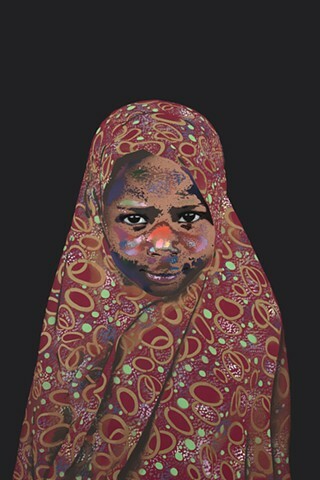 Power is the fourth painting in the Children of War series. She is from Darfur, and she and a lovely family from Saudi Arabia taught me something about myself. When I was searching for images of children that I would use in this series, every single one I selected grabbed my attention when I first saw it. And the names the artworks for which they would be the inspirations came quickly and easily. All, that is, except for one -this one. One Saturday in the studio while cutting stencils for this artwork I asked every woman and girl to look at her image and tell me the first word that came to their mind. There were some interesting responses but then a family from Saudi Arabia stopped in – a mother, father, and their two teenage daughters. I asked them the same question and, without hesitation, the mother said “power.” I loved the example she set for her daughters in that moment. After they left the studio I began to consider why “power” wasn’t so obvious to me when I first saw this girl’s image. Then I realized why – power was not a word I associated with girls. At a young age I learned it as a word to describe boys, not girls. As an adult I know better, of course, but ‘knowing better’ doesn’t mean that you always consciously correct a bias you’ve long carried. My inability to ‘see’ this word when I saw her is evidence of my own failure in that regard. And so I owe this Saudi family a debt of gratitude for making me realize (or reminding me) that one must practice self-awareness vigilantly so that our very best is offered to this world.